The Contact Center metrics dashboard provides data on the calls made to the university contact centers. 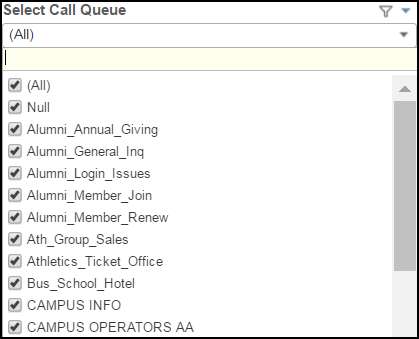 Each contact center is able to see their metrics and filter information by selected call queues. Access to your Dashboard is controlled by membership in an MCommunity group. Contact a group owner for your team to gain access to the Dashboard and your Call Queue(s). Select Call Queue(s) from the drop-down list in the top-right corner of the page. Note: If you don’t see any Call Queue(s), see First-time Setup.